Let’s start with stating that this is all my personal opinion. M’kay? I recently attended my first writing conference. It was put on by the Romance Writers of New Zealand and it was absolutely lovely. Everyone was nice and supportive and there were lots of great speakers. I knew going into it that I would be the only one flying the MM flag and was honestly a bit nervous about it. I know other MM romance writers have had pushback or negative reactions from their local groups but I’d just like to say that the RWNZ is full of very lovely people. The first question I got asked after every introduction was ‘what do you write?’. Before any other small talk ‘what do you write?’. After the nerves of the first day when I didn’t get any negative reaction I got comfortable saying ‘I write gay male contemporary’. If we didn’t move on to other small talk I’d pull out my copy of Empty Nests that I kept in my bag. (Let me say right here that a bright sunny Paul Richmond cover stands out in the sea of half-naked guys and buxom women. I got more comments on that cover than just about anything else all weekend.) I’d go on to explain that Dreamspinner Press did gay romance, pitched their imprints, discussed sales and audience, and generally waved the flag as high as I could. There were a few things that I heard from multiple people. If I said ‘it’s a niche market’. The response I got more than once was ‘I hear it’s a growing one’. The other comment was ‘how did you get into writing that?’. My answer ‘fanfic’. By Sunday morning (through a mild hangover) I realized it felt like I was pitching and writing in a mid-sized fandom which is exactly where I’m used to being. As of the time I’m writing this Supernatural has 111,570works of fanfiction posted to AO3. MCU has 105,831 works, not counting works tagged by individual movie or TV spinoffs. White Collar is sitting at 5,335 works and The Walking Dead (TV not comics) has 6,698. And little old BoJack has 5. I think this is nicely paralleling where MM is currently sitting in the overall world of the romance novel. I have faith that it will grow. According to Amazon, Dreamspinner Press has 6,197 works available. If you put Gay Romance into the search bar of Amazon it spits back 38,702 results. Compare that to the 731,819 you get if you just type in Romance. Now if you write something in the MCU or Supernatural fandom you are going to go up against a hundred thousand other stories on just one website. Yes you might write The Act of Creation Will Be Your Salvation or Twist and Shout and get a half million hits and even actors will have heard about you, but most likely you’ll be buried under the heap and you’ll get a couple hundred hits over the course of several years and maybe a few comments and you’ll be happy about it. If you write White Collar fic you’ll only be going up against five thousand other stories. Of course a little buddy cop show on USA never had anything close to the viewing figures of The Avengers but in my mind that means when someone finds White Collar fic they went looking for it. They were one of a handful who really liked the show and wanted to see just how much Peter/Neal fic there was out there. 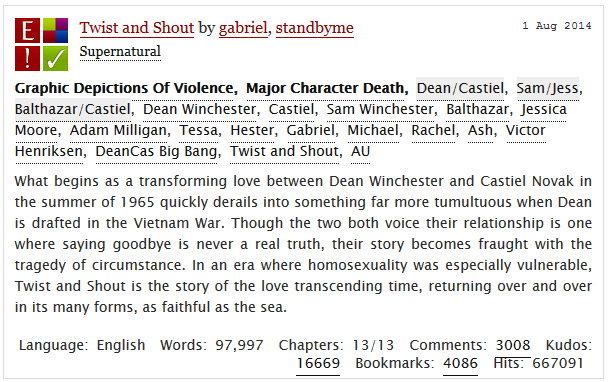 (1,020 fics for the record). It feels about the same writing in the MM romance genre. I don’t have giant sales or a million reviews but the direct feedback I am getting has been lovely. And not many seem to have stumbled on my books accidently. They’ve seen recs and reviews and were possibly pre-disposed to go looking. Out of the 150 other writers at the RWNZ conference (and admittedly I didn’t talk to even half of them) I didn’t encounter one who had stumbled upon an MM romance and read it. But just like back in the Babylon 5 days I pitched as had as I could to any who would listen and maybe with any luck a few will go looking.